Cats get enough ALA from their diets and don't need additional supplements. Alpha lipoic acid is a type of vitamin-like antioxidant that boosts immune system function and is produced naturally in the bodies of both humans and animals. Our feline friends are highly sensitive to this antioxidant, so supplements containing it shouldn't be administered to them because of its potentially toxic effects. Alpha lipoic acid -- also referred to as alpha-lipoic acid, lipoic acid, 1,2-dithiolane-3-pentanoic acid, thioctic acid or valeric acid -- is an antioxidant similar to a vitamin. It's not considered a true vitamin because human and animal bodies can produce it and it's not needed as a supplement to maintain our health, according to Drugs.com. ALA is fat-soluble and works similarly to a B-complex vitamin in the body by converting glucose into energy. It's present within all of our cells and those of our feline friends as well. The sulfur-rich antioxidant also helps the body fight substances called free radicals. Free radicals are harmful waste products that are produced when the body converts food into energy. Red meats, muscle meats and organ meats like liver, kidneys and hearts are the foods richest in alpha lipoic acid. Other foods that contain ALA include yeast, spinach, broccoli and potatoes, according to Drugs.com. Many of these ingredients are included in commercial cat foods to meet your kitty's need for the antioxidant. Don't confuse alpha lipoic acid with the omega-3 essential fatty acid called alpha-linolenic acid, which our furry buddies also need in their diets. Alpha-linolenic acid, also called ALA, helps keep your cat's skin and coat shiny, according to the "Cat Lover's Daily Companion: 365 Days of Insight and Guidance for Living a Joyful Life with Your Cat." Sources of alpha-linolenic acid include walnuts, flax seed and canola oil, according to the Kirkland Science Labs website. Your feline companion doesn't require supplements containing alpha lipoic acid to maintain her health. In fact, ALA isn't listed as necessary for felines in the nutrient profile created for cats by the Association of American Feed Control Officials, according to the U.S. Food and Drug Administration. 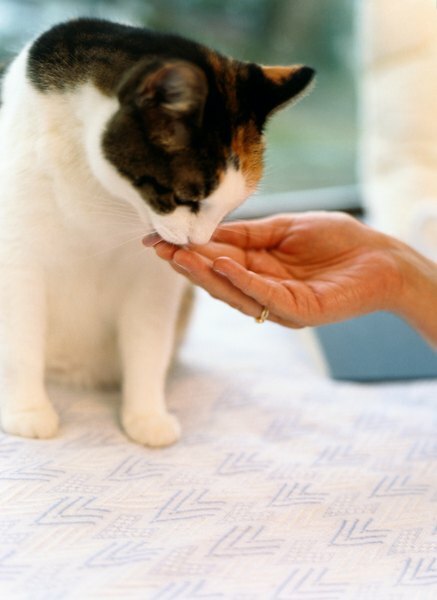 ALA supplementation can actually be harmful to your kitty in some cases. A study published in the April 2004 edition of the "Journal of Animal Physiology and Animal Nutrition" showed that ALA was 10 times more toxic to cats than to other animals, including dogs. The maximum dosage tolerated by kitties was found to be around 13 mg/kg, with approximately 30 mg/kg causing liver toxicity, reports a 2009 article published in the "Journal of Veterinary Emergency and Critical Care." Your kitty gets all the alpha lipoic acid she needs from her meat-based diet because felines are obligate carnivores that require meat to stay healthy. Alpha lipoic acid is sometimes included in supplements designed to help pets suffering from cognitive dysfunction syndrome, also referred to as feline dementia, according to the Feline Advisory Bureau. Cat-safe versions only contain ingredients like omega-3 fatty acids, vitamins C and E, L-carnitine and other antioxidants, but don't include ALA because of its potential toxicity to kitties. For this reason, never give your kitty antioxidant supplements or foods formulated for dogs, which may contain higher amounts of ALA than are safe for our feline friends. Cat Lover's Daily Companion: 365 Days of Insight and Guidance for Living a Joyful Life with Your Cat; Kristen Hampshire et al.